The Swedish cleantech company Ripasso Energy has developed a unique solution to harness energy from flare and industrial residual gas combustion. A solution based on the Stirling technology, a 200-year-old invention with decades of operation service in Swedish submarines, that can cut costs and lower carbon dioxide emissions for the South African mining and processing industry. Many industrial applications, especially in the metallurgical sector, produce byproducts in the form of gases (residual gas) that are currently burned off (flared) without harnessing the energy. Up to 50% of the energy in a furnace process is lost in form of waste gas. To be able to recycle some of this energy is of course attractive, both from a cost as well as an environmental perspective. For decades different technical solutions have been tested but have in general been unsuccessful of various reasons. Some of them have been too expensive and/or require costly investments that makes the price of the recovered energy significantly higher than the market price of electricity. Another common problem has been the fact that residual gas is generally of such uneven quality that engines based on internal combustion have a hard time handling it. For example – the gas from a ferro-alloy furnace at some stages have 60 to 65% CO and 10 to 15% H, and in the next moment it switches and have 45 to 50% CO and up to 25 to 30% H. For internal combustion engines this is a major problem as a phenomenon known as “knocking” can occur, which damages the engine. Fig. 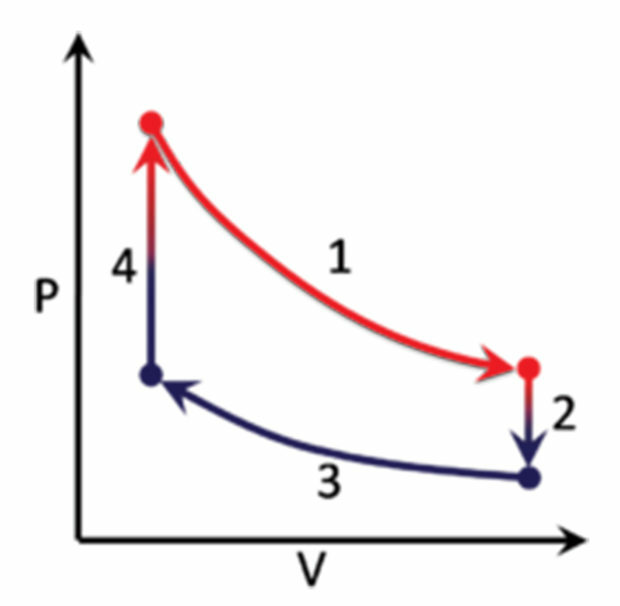 1: Illustration of the Stirling cycle plotted in a diagram which shows the pressure (P) and the volume variations (V). Ripasso Energy has developed a solution that effectively can turn waste gas into electricity with unrivaled cost efficiency by using Stirling engines, based on Swedish Kockum’s world-class Stirling technology for submarines. The Stirling engine, which is what is referred to as a gas pressure engine, was invented in the early 19th century. From a historical perspective, its practical applications have been limited compared to, for example, the internal combustion engine, with the result that the technology has never had a major commercial breakthrough. Combined with an overall societal push to reduce the use of fossil fuels, the refinements made to the technology in recent decades may mean that the breakthrough is at hand. 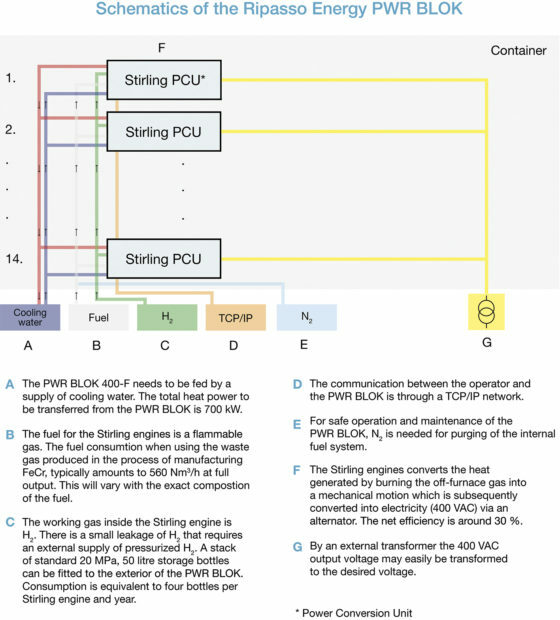 The Stirling technology has several characteristics making it particularly well-suited to the development of cost-effective solutions for climate-friendly power generation. Qualities that other engines and solutions lack completely or are significantly less well-positioned to offer. Among other things, the Stirling engine can be operated using any heat source at all, in principle. The combustion that drives the engine takes place externally – i.e. outside of the engine itself. It is quiet and virtually vibration-free. Above all though, the Stirling engine features very high efficiency, i.e. the ability to convert thermal energy to kinetic energy. In its simplest version, the Stirling engine is a closed system with an expansion cylinder and a compression cylinder filled with a working gas. The pistons of the cylinders are linked by a connecting rod. When the working gas in the expansion cylinder is heated, pressure increases. This depresses the piston and thus performs work. Part of the power is used to force the hot working gas from the expansion cylinder into the compression cylinder. Once its outward motion in the compression cylinder is arrested, the piston returns by the inertia of the connecting rod, and by the fact that the working gas is compressed at low temperature. The gas is then forced back into the working cylinder. On the whole, the expansion of the hot gas in the expansion cylinder does more work than is needed to compress the cold gas in the compression cylinder. This work can be used to drive an electrical alternator that is directly connected to the engine’s connecting rod. The Stirling cycle itself is the most efficient thermodynamic cycle for the transformation of heat into mechanical energy. The engine operates without internal combustion and is dependent only on an external heat source. That makes it ideal for use as a converter of thermal energy into mechanical energy. A constant quantity of hydrogen gas is heated in the engine (4 in figure below). Through its expansion when heated (1 in the figure below) and contraction when cooled (2 and 3 in the figure below), the gas sets the pistons in motion. The pistons are linked by a connecting rod that drives an alternator that produces electrical energy. The efficiency of the Stirling engine increases at high temperature differentials between the hot side and the cold side. As there are no internal contaminants caused by combustion, the pistons, bearings and seals have a very long service life. Fig. 2: Schematic of the Ripaso Energy PWR BLOK. PWR BLOK is a container-based product is specifically designed to cost-efficient extract energy from residual gases. It contains of 14 Stirling engines arrayed in a 45-ft container and delivers total net output of 400 kW. The Stirling engines remove the risk of dealing with volatile gas because they burn it in a combustion chamber under very low pressure and with no compression, just heat. The engines are, thanks to the external combustion design, practically indifferent to the type of gas burned and to the quality of the gas in question. This also gives low maintenance/service (6000 h) since the fuel don’t contaminate the inside of the engine itself. The PWR BLOK’s pricing gives the customer a payback period of around three to four years. The technology’s service life is at least 25 years. A clear example of the benefits offered by the PWR BLOK can be seen in the ferrochrome industry in South Africa. This industry produces large amounts of residual gas that are currently flared off. At the same time, electricity costs account for nearly a third of the industry’s total production costs. Ripasso’s solution makes it possible to burn the gas while at the same time using it to generate electricity at a cost of just 20 EUR/MWh, a record low for climate-friendly electricity, and very competitive to the industry’s average price today of 52 EUR/MWh. Since this also reduces the company’s need to purchase electricity from the grid by up to 15-18%, it in turn reduces the companies’ carbon dioxide emissions. South Africa currently generates approx. 87% of all its electricity from fossil fuels, according to figures from Eskom. Ripasso’s technology enables an annual 3500-tonne reduction in carbon dioxide emissions in South Africa per PWR BLOK installed. The post Swedish submarine technology turns industrial waste gas to electricity appeared first on EE Publishers.